John William's novel Stoner was published in 1965, but has recently enjoyed a slight return to appreciation thanks to a reprint from New York Review Books. I'd stumbled across a couple of reviews of it over last few months, and since all of them were very positive I ordered the book and looked forward to it with much anticipation. Thankfully, this was rewarded. 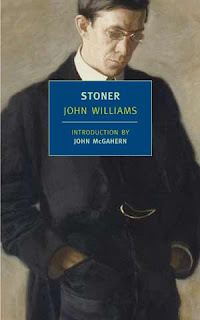 Stoner is a quiet, well-observed novel of some considerable emotional heft. It's the story of William Stoner, a young man from rural Missouri in the early 20th century. Sent by his farming family to study the new Agriculture degree at the university, Stoner is instead entranced by the compulsory English literature course he takes, and changes degree (without telling his parents until graduation day). From there, he continues with postgraduate study and teaching, eventually making a full-time career of it. At the same time, he meets, falls for & marries Edith, and Stoner is the story of his two relationships: with his career and with his wife. At a little under 300 pages, Stoner takes us through its protagonist's life from 18 through to the end of his career in his mid-60s, yet never feels rushed. It's a slow, quiet story, and thus finds the perfect marriage of form & content, since Stoner the man is also slow, quiet and low key. He finds his feet as a lecturer, becoming popular on campus, but also making an enemy of one of his colleagues in the department. Meanwhile, his marriage to Edith descends fairly quickly into a mutual disappointment (it is clear from early on that she doesn't particularly care for him at all), and thus Stoner finds his main satisfactions in life through his teaching. Williams' prose throughout is spare, simple and beautiful. The main characters - Stoner, Edith, and his best friend Gordon Finch - are all well-drawn, although Edith sometimes edges a little close to being cruel to Stoner for its own sake. (Although this can be explained by the novel presenting his side of their relationship.) Lomax, Stoner's nemesis, seems mostly to serve as a plot device, rather than as a character in his own right, but again: his relationship to Stoner is essentially that of an obstacle.